WASHINGTON — President Donald Trump's negotiations with Democrats over the fate of legal protections for so-called Dreamers is the latest shock to rattle Capitol Hill, leaving Congressional Republicans blaming their own party leaders for not being more involved in the negotiations. The president insisted Thursday that no real deal had been cut, but he urged Congress to move forward and indicated that while strengthening border security remained a priority in exchange for extending protection to current DACA recipients, funding for his long-promised wall wasn't a must. The possibility of such a deal kicked off confusion in Congress as Republican leaders and some Trump allies said that no deal had been struck while other rank-and-file Republicans complained the president has been forced to find negotiating partners in the other party due to a lack of leadership in their own. "We shouldn’t cede this to the Democrats to cut a deal," said Rep. Tom MacArthur, R-N.J. "I’m all for a bipartisan deal but it should not be just a deal with House Democrats, Senate Democrats and the White House. If that happens, to me that’s a failure of Republicans here in Congress." House Speaker Paul Ryan, who has spoken with the administration twice since Trump's dinner with House Minority Leader Nancy Pelosi and Senate Minority Leader Chuck Schumer Wednesday night, insisted that there's no deal yet. "First off, there is no agreement," Ryan told reporters Thursday morning. "The president and the chief of staff called me from Air Force One today to discuss what was discussed. And it was a discussion, not an agreement or a negotiation." Despite White House attempts to clarify the situation, Trump's public statements and his tweets indicate that while he did agree that border security would be included in any deal, the physical construction of a border wall was a separate issue. “Well, we want to get massive border security and I think that both Nancy, Pelosi and Chuck Schumer — I think they agree with it," Trump said before he left to visit Florida to see Hurricane Irma’s impact Thursday morning. "I think we’re fairly close, but we have to get massive border security,” he said. Many prominent voices from within the conservative movement raised alarm over the initial reports of a deal, but by midday, most seemed assuaged. Rep. Mark Meadows, R-N.C., the chair of the conservative House Freedom Caucus, said that he spoke to his contacts in the White House and they reassured him there was no deal on DACA. But he also acknowledged it was agreed that a border wall would not be part of it but border security would. Meadows said he did not see a problem with that. Many Republicans, who did not think a wall was the best way to secure the border, are privately relieved if a border wall remains off the table in DACA talks. “Trump heading this deal gives members cover with his base. Combine that with the fact that most members just want to get the issue over with and move on, I think this has legs,” an aide to a conservative member of Congress said. However, Meadows said that it if a large-scale deal was reached between Trump and the Democrats with no Republican Congressional leaders present, "that would be a problem." Others saw it as progress. Rep. Chris Collins, R-N.Y., a longtime Trump ally, said that Trump's talks with Democrats are "good." "In this case the president, the CEO of the country, wanted to test the water with the Democrat contingent in the House and the Senate," he said. "This is Donald Trump taking control." Rep. Peter Welch, D-Vt., said it wasn't a problem that McConnell and Ryan weren't in the room. "It allowed them to make progress," the moderate Democrat said. Any agreement between Trump and Democrats, however, must be approved by House Speaker Paul Ryan and Senate Majority Leader Mitch McConnell in order for it to move through Congress. This is the second substantive legislative progression between Trump and Democrats in just one week, bypassing Republican leaders. 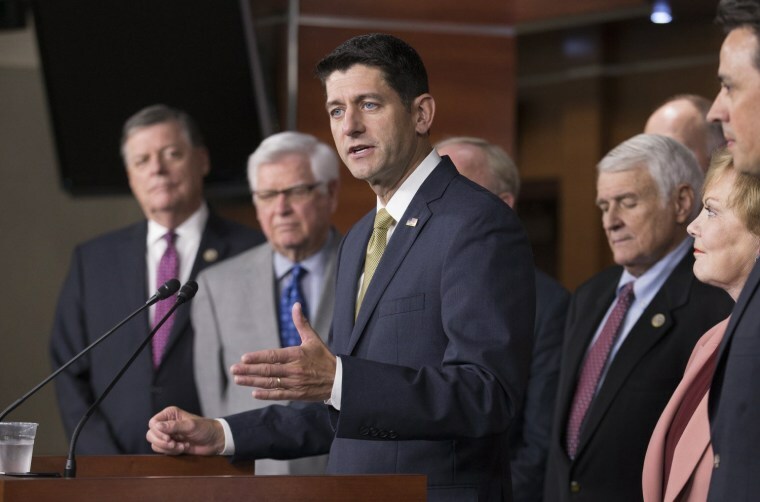 That could be crippling for the leaders as they attempt to pass major tax reform legislation and other conservative agenda items. Conservatives also blamed Ryan and McConnell last week when Trump agreed with the Democrats' plan to lift the debt ceiling by just three months. "You can't criticize somebody when there's not a conservative proposal that's put forth," Meadows said. "You gotta give the president conservative options. There was not a conservative option on the table." Meanwhile, Trump's base was infuriated by the apparent DACA agreement. Breitbart, the news organization run by Trump’s recently ousted top adviser Steve Bannon, blasted the president as "Amnesty Don." "Amnesty" is a four-letter word for tough-on-immigration conservatives. One of the most consistent and popular issues during Trump’s presidential campaign was immigration and his promise to build the wall. Conservatives thought his repeal of DACA, President Barack Obama’s executive order that gave undocumented immigrants reprieve from deportation, was an opportunity to jump-start the building of the wall. “I mean this was a straight up promise all the way through his campaign. And, might I add, that I’ve told the president that I market-tested his immigration policy for 14 years, and we spent a lot of time in Iowa having those debates and discussions, then across New Hampshire, South Carolina, and beyond," King said on CNN. "I don’t think it’s unclear to anybody what those campaign promises were, but it looks to me like he’s preparing to keep Hillary Clinton’s campaign promise rather than his own." CORRECTION (Sept. 15, 11:57 a.m.): An earlier version of this article misstated the party affiliation of Rep. Peter Welch. He is a Democrat, not a Republican.